FOR SOME OF US, LIFE IS A HUMBLING EXPERIENCE. Looking back on my teenage years, my favorite time of year was Spring. I’m sure it had to do with school ending and summer being close. Wonderful summer....with fun days of swimming, sunbathing, falling in love again, and again…. but, at the same time, I dreaded summer. Mostly, I dreaded my family’s annual trip to Fornfelt, Missouri, to visit relatives. Oh, don’t misunderstand…I loved my grandparents, but I despised their outhouse. It was only in later years that I realized the smallness of my thinking; the limited attitude of my youth. My father worked constantly to provide for our family. We were considered average…middle-class…not wealthy by any standards but, in the eyes of poor people, our family was rich because…we had an indoor bathroom. Re-examining my memories, I know now that my grandparents were poor. If it hadn’t been for their five grown children, including my father, they would have suffered a pitiful existence. Luckily, my father and his siblings sent their parents money, regularly, to pay for rent, utilities, groceries, medical bills, and other needs. But, it wasn’t enough to raise their standard of living in a poor town like Fornfelt where almost everyone had an outhouse. During one of our summertime visits, I saw the Outhouse Cleaner. He was a very old man with a horse-drawn wagon who had the responsibility of scooping outhouse waste into large metal drums, attached to his wagon. Somehow he made enough money to feed his horse and himself but how…I don’t know. I don’t think it was an accident that he performed his outhouse duties at night, under cover of darkness. For centuries, the outhouse was the accepted place to perform bodily functions; to answer nature’s call; to relieve one’s self. Outhouses didn’t have lights, running water, heating or cooling, and, most importantly, there was no toilet paper. Anyone headed to the outhouse must not forget to grab tissues, newspapers, or whatever helped with the business ahead. Traditional outhouses were equipped with one or two round holes cut into a board that served as seats for outhouse users. If you were lucky, the outhouse you used had a “top” for each hole---- large circles of wood with a handle on top. 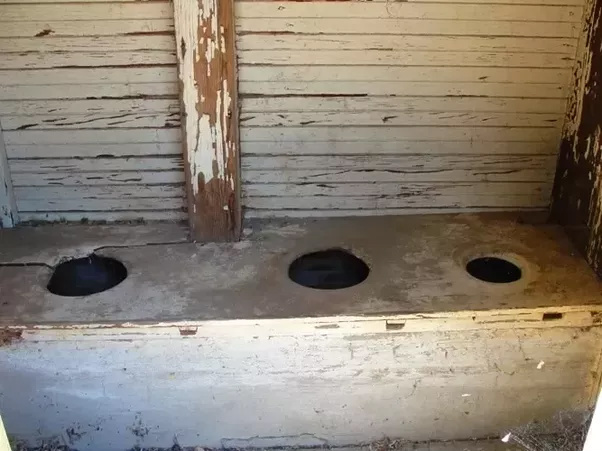 Unfortunately, my grandparents’ outhouse didn’t have hole-covers and, trust me, the only thing worse than staring at mounds of human waste was the smell! The odor in the outhouse was breathtakingly-horrible, so bad that no one wanted to linger…once business was finished. I see it often----a Television Commercial showing Bears talking about using the bathroom and preferring the softness of a certain brand of toilet paper. One of the Bears, I think it’s Poppa Bear, says “Everyone has to go so why not enjoy the go?” I find the commercial irritating because yes, we all “go” but enjoying it isn’t mandatory. Yet, where you do "your business" shouldn't be a traumatic experience. I often think how something so simple as indoor plumbing, a basic bathroom, could have enhanced the quality of my grandparents' lives. Too bad we can't relive the past--if only for a few moments -- to add some additional happiness--where-needed. Today’s challenge: Think about where you use the bathroom every day. You take it for granted that the bathroom will be warm in winter, cool in summer, that the toilet will flush, you’ll have toilet paper and…. when you’ve finished, there’s a sink near by—with running water--- for hand-washing. The next time you “take a bathroom visit” ….remember just how good you have it. Even with today's modern technology and major advancements, too many people still use an outhouse. PS….and IN MY OPINION, the huge spiders in the Outhouse are as horrific as the smell!